So I'v been making tones of videos related to how cars are broken and how big is the influence they have in pvp. Couple of months ago i made the post where i reported such a thing,You made one update (fixed the bus - not rly its still bugged) and then...nothing. Me and my friends are dying 24/7 with snipers/valuable loot because of the cars. And whenever I report the bug related to the cars ppl are just xdd or are jsut memming instead of giving me answers which pisses me of so badly that I dont rly understand why i still play this game. This is killing the game - not only survival and making ppl mad asf. So again after 4 months Im making another thread and I hoep this time my prays will not be ignored. 1.Every car can kill ppl camping behind walls/trees/fences. 2.Every car is broken - no mater what car you are inb sometimes you will get a nottification that you can't exit the vechicle which will end up you being dead/having to reconnect. 3.Sometimes if you leave the car you are getting teleported miles away. 4.Sometimes when u leave a car you are getting kicked out into the sky and then eventually will die form the fall damage or luckilly jsut lose 3/4 of your health. 5.Cars are buggy asf and sometimes are acting like planes or Apollo 13 mission rockets. 6.Sometimes you can't repair a car no mater how much you try the repair window does not appear. 7.When you are in the car and the other car hits you you will die. 8. Cars driving over 25MPH are not reciving any dmg at all. i think not happened all times and there are some bug. The problem with vehicles affects both PVP and PVE. The volatility of every vehicle is the problem. They worked just fine when there were only the ZK, Stryker, and Buggy. Even after adding the Bus the problem wasn't there. As more and more vehicles were added, the ability to control them has been a problem and has magnified with each new vehicle. You can't even drive down the road anymore. You hit bumps that are not there and the vehicle goes flopping around, rolls over and in most instances, ends up facing the opposite direction. I have tried to draw attention to the vehicle system problem for a very long time. What I was finally told was that it was up to Fred to fix it since he was the only one that had that ability. So, that brings us to today. Is this going to be the beginning of something finally being done to fix the vehicle system? It's tiring getting stuck on objects and not being able to exit, having to quit and rejoin, only to find that you have either 1) lost the vehicle to someone else. 2) got killed by a group of zombies and the car has exploded. 3) been killed by another player in PVP thus losing everything you had in inventory. PLEASE!!! WE IMPLORE YOU!!! FIX THE VEHICLES IN ONE OF THE NEXT TWO PATCHES!!! THE COMMUNITY DESERVES BETTER VEHICLES!!! Oh and Warren, this IS a bug, NOT a feature. The vehicle system is broken and has been for a very long time. Here is a prime example of what it's like to be stuck. In this instance, I'm stuck on a pile of unnecessary boulders. If you look on the right side, you see where it says, 'CAN'T EXIT VEHICLE' This location is southwest of Nato. I had to quit and rejoin before I could retrieve my car. It is a very difficult crash and we are trying to cause that problem on our dev servers since weeks now. The car issue has the highest priority from my side. Keep sending crash reports, you will help me a lot. Thanks! Anyways the problem with the cars is we don't have these issues on the dev server. I am sitting daily on it and try to get a crash or any other kind of error. This is normal, keep in mind cars are there to drive them on the street. When you drive in the forest and make a jump over a hill and get stuck, then it's your own fault. Thanks for the feedback here, I am looking forward to fix these cars finally or we have to completly remove them. We will see. 2-6 Thanks for the report. 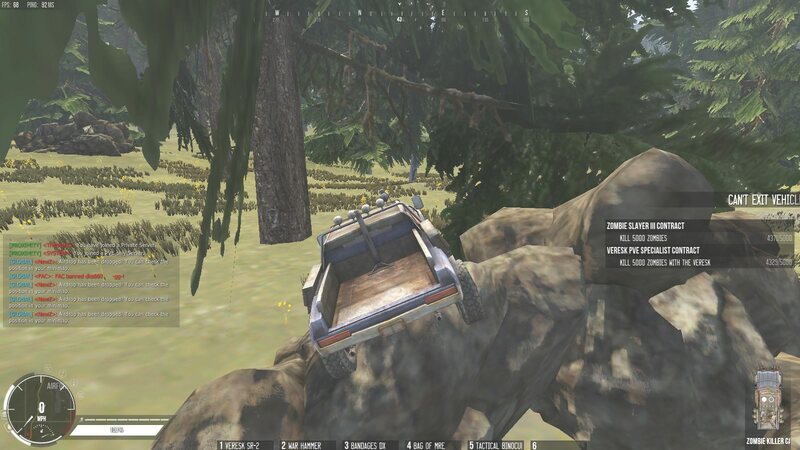 What if we just completely disable vehicles in the game? I mean, considering the amount of issues, crashes this causes, and all the other countless problems this might not be a bad idea. It's sad. And I agree, we should 100000% fix this ASAP. From the other hand, I know how much work it's gonna be to properly do all this. I wish I was an expert on this myself, but I am not unfortunately. From my end there is not much I can really do here. @The Wraith buy better brain m8. These issues aren't caused by my pc (which is decent) and my internet connection is solid. On the first video my ping is above 200 because im was playing on hk servers and I'm from Eu so please think before u say something stupid next time. Did you actually noticed that the "Less copy & paste and more own words" wasn't for you? Back to the problem. It doesn't matter if rocks are around, atleast the streets are free. When you guys drive through everything and stuck, you can't complain about the game, that's just a fact. Gleenwood only has destryoed streets besides the main street next to the bus stop (OW). How the rocks are placed there has nothing to do with the vehicle problems like "Can't exit". Anyways here you can find the poll/feedback thread where you can give your feedback about the vehicles in the game. As for me, I would not consider it as a substantial issue in this game. I remember the days there were no cars in this game (WarZ) at all. That's okay if we have bugs with it, the devs probably gonna find a way to fix some of them later, the game is still playable. To me, the lack of balance in sniper rifle gameplay is much worse. I personally don't find any fun in using a sniper rifle, I like ARs. And the ARs are absolutely worthless in this game, against an average sniper. No matter how good you are. There are tons of sniper rifles available, it's not a rarity at all. So, there's no fun for me at all in playing at MOST of the servers in this game. Guess how insignificant the car problems are for me.